Do you know what filmed at Rampart and Sixth? What filmed near your street? Find out in a new book from Arcadia Publishing. But a film book that is purely photos of stars on location, with an informative caption about the film and location, not only can be a pleasure but simply is just that. And that is exactly what the new "Location Filming in Los Angeles" book from Arcadia Publishing does. Nearly every page contains two great photos of two older films, and where exactly that film was made in our city. Sometimes you can tell where the photo was taken, sans caption. Any snapshot from Union Station, say, or the Beverly Hills Hotel. Usually, further reading helps, and helping that are authors Karie Bible, Marc Wanamaker, and Harry Medved, a true triumvirate of local powerhouses in the knowing-everything-about-Hollywoodiana department. Westwood Village still looks the same in 70-year-old photos. Santa Monica Pier? Not so much. It's a tasty travelogue of our town, with a lot of recognizable actors peopling the pictures. So it is no surprise that the book, which debuted at the end of November, is on back order. But since you're probably not in holiday-gift-buying mode now, you have time to wait on this one. It's worth it. Price is $21.99. 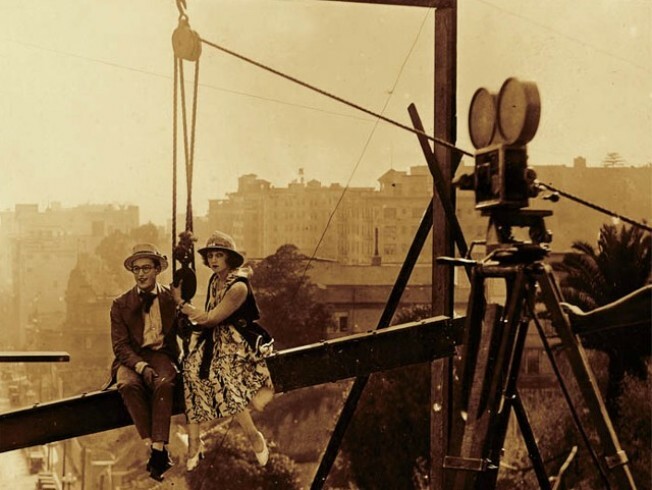 Final thought: Why don't actors sit on hanging beams over downtown any longer? Wasn't that such the thing back in Harold Lloyd's day? Kind of miss that. Actors everywhere, get on that. But of course, please remember: safety first.